« One Nest To Go-But Where is Mom & Dad? After a long evening of re-hydrating the purple martin nestling and then this morning continued Gatorade and crickets, the nestlings belly was much softer, poops were normal and most importantly-he was still alive. All morning without any chirps, I was wondering if mom was anywhere around. Usually you would think that the nestling would give out a few chirps if he heard her. I did see a SY female coming to the porch twice in a 4 hour period. Once to drop off a large cicada on the outside porch. I wasn’t impressed with her efforts. At around noon I lowered the gourd rack and took out the 2 thin-est of the remaining 4. I left the 2 strongest nestlings which after careful aging, I determined them to be 22 days old. The runt definitely is feathered, for the most part, like a 16 day old. The 3 skinny ones then made a 20 minute ride to Busch Wildlife Sanctuary in Jupiter after having a drink of gatorade. I met David Hitzig, the executive director of the facility. It was great to finally visit this center that I had heard about but never visited. As you may know from previous posts, I had always used Folke Peterson, which is only a few minutes away, but now that they are closing (due to financial problems) this was a wonderful opportunity to make the drive. Had I known what a full service, top notch facility it is, I would have come sooner. I brought the family and my 2 boys were kept happy and amazed at the animals including Florida Panthers, Deer, foxes, birds of prey and every sort of native Florida wildlife. I meanwhile spoke with David. He is astute and quite aware of the dilemma these birds find themselves in. 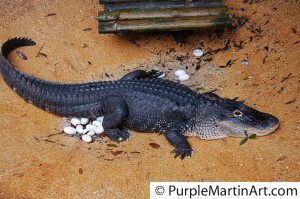 Being so late in the season, and no other nests that could foster them, the best place for them is with momma. As negligent as she is, their best hope is to fledge with her. Without the post fledging care that they will receive, their chances are dismal and I know it. My fear is that the runt will be so malnourished, that he would die or be so far behind in growth that he would be left behind or easy pickings for a predator. David saw to it that the birds received a fluid injection to hydrate them quickly. They also got a big meal of juicy live crickets and meal worms before I took them home. Now that the runts belly was softer and poop was normal, I feel much more comfortable returning him to the nest with a day of rescue feedings under his belt. The 3 were very active on the drive home and after a quick stop at the pet store to by a dozen live crickets, I gave them one last drink of Gatorade and belly full of food. I lowered the rack and placed them back in the nest after checking the 2 much heavier nestlings. I did see the mom flying about and I think I know what is going on. Before returning the nestlings I heard her calling out to the nestlings with her chew chew call. A call I hear the parents make when they are trying to coax them out of the nests to fledge. That would explain her leaving the food on the outside porch. She is trying to lure them out so they will fledge. Unfortunately she is inexperienced and like most birds, has no access to a calendar. She has no idea that feathered as they are the birds are just not ready to fledge. The runt is so under feathered that it would perish for sure if it didn’t die from the malnourishment first. The nestcam is now on gourd #6 and my eye is fixed on the action. 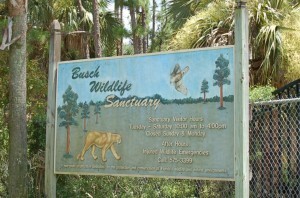 Many thanks to Mr. David Hirtzig and to Busch Wildlife Sanctuary. I will be sending in a donation to this fine facility and coming back again soon. This entry was posted on Saturday, July 11th, 2009 at 4:20 pm	and is filed under Birdcam, birding, Fledgelings, Nest check, Purple martins, Webcam. You can follow any responses to this entry through the RSS 2.0 feed. You can skip to the end and leave a response. Pinging is currently not allowed.